Patrick Creel of the Real Tampa Bay Ghostbusters at San Diego Comic-Con in 2010. The recent announcement that "Ghostbusters" would be returning to select theaters for a brief run starting Thursday was welcomed by many fans of the beloved 1980s franchise. But the people who are really excited about it are those fans for whom "Ghostbusters" is a lifestyle. They start chapters of Ghostbusters across the country and beyond, showing up at parades, charity events and, of course, conventions while dressing the part. In most cases, they travel around in their own version of the famous "Ghostbusters" Ecto-1 automobile. 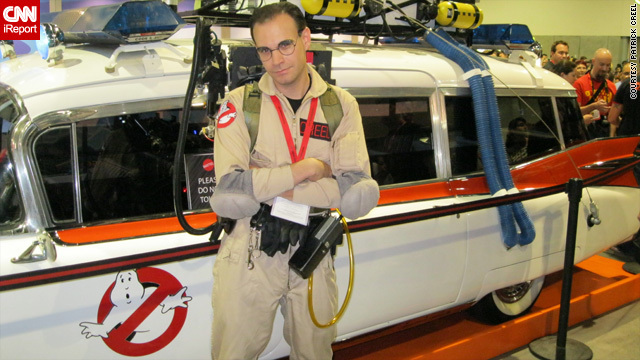 CNN Geek Out spoke to Chris Stewart of Vancouver, British Columbia, webmaster for one of the oldest "Ghostbusters" fansites, Proton Charging, and Patrick Creel, an iReporter with the Real Tampa Bay Ghostbusters. Wednesday is the best day of the week because that’s when the new books arrive in stores. Here are some of the comics scheduled to hit the shelves on October 12. Your local retailer will probably have these and others, so make sure to check with them for more details. The book I am really looking forward to reading this week is Boom Studio's "Elric the Balance Lost #4". I love this title. The storyline has me hooked. I'm a longtime fan of Michael Moorcock's "Eternal Champions" novels, and Elric is on the top of my list of cool characters. He gets his power from an evil sword that drinks souls, but Elric is trying to control the sword and do good things. I think that Chris Roberson is doing a great job writing this book and Francesco Biagini's art captures the look and feel Moorcock was going for when he wrote the novels. That's what I am excited about. What comics are you looking forward to this week? Is there a comic out there you really love? If so let us know in the comments. We are always looking for tips on good comics! Adam J. Ruben strikes a wacky pose atop a fiberglass lion at a mini golf course in 1990. Adam J. Ruben, a comedian, writer and scientist, has been called a nerd for most of his life. Does he fit the bill? Probably. He was in the Princeton marching band. He clearly had no qualms about wearing suspenders in 1990. He kept an audio diary in seventh grade. And today he's taking his one-man show, "Don't Beat Me Up: Stories and Artifacts from Adolescence" to his high school alma mater, performing for the freshmen class while the sophomores and juniors take the PSAT. It's a spoken word performance based off of diaries, poems and other documentation of his grade school life as the object of so many bullies' attention. The show started out as an act of commiseration with peers, fashioned primarily as a comedy. "Most of it is joking about how lame we all were and how nerdy we were and looking at it now from this side," Ruben said. But it does expose the pain of growing up in America as a nerd. "I don't think any of the nerds at my school had that one day where they stood up to the bully and the bully backed down, like that scene in 'The Christmas Story' where Ralphie Parker stands up to Scut Farkus and starts wailing on him," Ruben said.